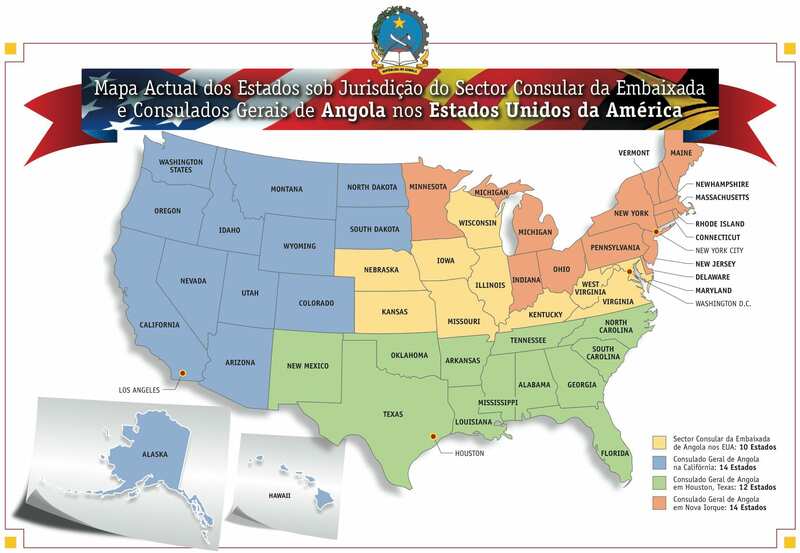 The Consular Section of the Embassy of Angola in US-Washington, D.C., provides assistance and services to Angolan citizens living in the area of its jurisdiction as well as visa services for all Americans and Foreign citizens residing in the U.S. The consular service in Washington-DC is headed by Mr. Manuel Francisco Lourenço, who is the First Secretary. Varieties of services are provided for the Angolan citizens, such as issuance and renovation of a national passport, notary and legalization services and birth certificates. The Consular Section is also available to answer any questions/concerns. Monday through Friday, from 9:30 am to 3:00 p.m.
Monday and Wednesdays from 09:30 am to 1:00 pm. drop off days only. Tuesdays and Thursdays from 12:00 pm, to 3:00 pm, pick-up days only. Friday we do not open for the public in general unless, it is an emergency that had been previously notified by Head of the Consular Section of this Diplomatic Mission. The Angolan Community may contact the Section for business. For emergency, Angolan citizens may visit the Consular Section of the Embassy at any time during business hours, or contact the Head of the Consular Section at (202) 285-0999, after hours. If you have just arrived in the USA, you may register with the Consular Section at the Embassy by filling out the Consular Registration Form (Consular Registration Form). The Consular Registration process is free of charge. We kindly request those who have already registered to encourage their friends and relatives to do the same. (202) 785 1156, or Fax: (202) 822-9049.